Sometimes my iPhone gets sluggish and doesn’t respond as quickly as I’d like it to. Or it runs out of battery power more quickly than expected. I’ve learned a few tricks that might help you too. Turn your iPhone completely off. To do this, hold down the power button on the top right of your iPhone until it says “Slide to power off”. Slide the button over, wait five or ten seconds, then power it back up again. 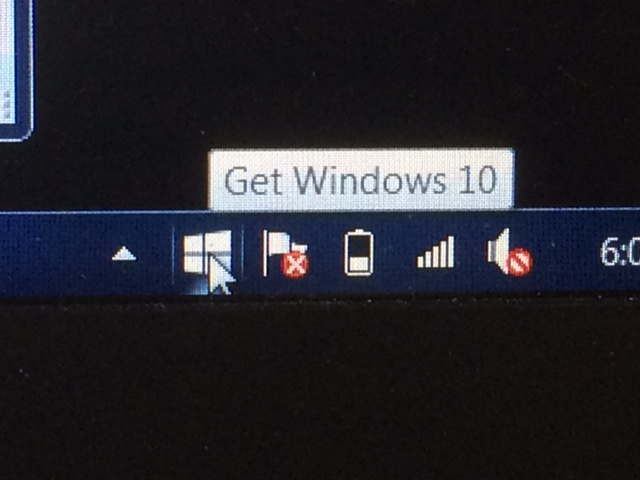 I know Steve Jobs said that only Microsoft computers need to be turned off to reset themselves. But sometimes Apple products need to be reset too. Close down any applications that your iPhone is running, but you’re not using. Double click on the Home button and it will show you all the apps you’re running. (The Home button is the one on the bottom of the screen, in the center.) Select the apps you want to close and, with your finger, simply slide it up and off the screen. If there are apps on your iPhone that you’re not using, delete them entirely. That will free up some space. Find the icon for the app on your screen. Place your finger on the icon until it starts wiggling and a small “X” appears in the top left corner of the icon. Press the “X”. Your iPhone will ask you to confirm that you really want to delete it. Remember to press the Home button when you’re done. Put your iPhone in Airplane mode. Click on Settings and slide the button over. When your phone is in regular mode, it is constantly checking the location of nearby towers. It doesn’t do that in Airplane mode, so you can charge your phone much faster. If you know you’ll be in an area without reliable cell service, putting the iPhone in Airplane mode also conserves your battery. Remember, you can still use WiFi even with the cell service turned off! When I’m off on a road trip, there are a few websites that I have bookmarked for easy access. Many of you know how many road trips I take so these resources are invaluable for me! I hope you find them useful too. This is actually my favorite site. It helps me plan road trips that get to all the places I want to go. If I want a quick highway-only kind of trip, I can do that. If I want to stick to the local roads, I can do that too. Google Maps tells me where the construction will be and how long the trip will take. Our country has so many amazing sights to see and the NPS has preserved many of them. When I know I’m going to a particular Park, like Yellowstone, or the Sand Dunes, or Arches, I take a look at this website to see what I need to be aware of and how to best plan my trip. I’ll admit it. My backcountry camping days are over! If I am camping, I want a place with a shower and a real toilet! I’ve been camping at KOA’s for most of my life as my parents took us around the country in our VW Camper in the early ’70’s. This site helps me find a campground near where I’m heading. Once I’ve decided on a destination, I search for the local Chambers. What activities are going on? Which businesses cater to tourists? Are there any coupons? What funky tourist attraction is this town known for? This site is helpful when I’m planning to stay at a hotel on the way. I’ve even found that Yahoo!Travel has access to lower prices than some of the other “discount” sites. It’s summer and time for the weather to act up! Before the next ___Insert Disaster Here (Flood/ Fire/ Tornado/ Hail Damage/ etc. )____ occurs at your house, there are a few things you should take care of right away. Back up your data to the “cloud”. We use Dropbox which I find very easy to use. There’s also Google Drive, iCloud, Microsoft OneDrive, and others. (Here’s a link to a review of 13 different options for you.) Make sure you choose a solution that backs up continuously, and is accessible from all the computers, SmartPhones, and Tablets that you commonly use. Because Ransom-ware is a bigger problem I also recommend that you have a hard copy of your backup. Ransom-ware is a new type of malware. The hacker gets into your system and locks you out of it unless you pay a ransom. This also affects data you’ve backed up to the cloud. At least once a month, back up your data to a physical source – an external hard drive, DVD’s, etc. Then store them in a location outside of your home. To protect your data, you really only need a hard copy back up. But you’d need to do it very frequently in order to capture any changes to any of your files. In my experience, people are just not that disciplined! Plus, you have to remember to take it with you if you have the luxury of packing for an evacuation. Better to upload file changes automatically to the cloud and take a physical backup once a month, or after you’ve finished a big project. Put your important stuff in an area that’s easy to access in case your home is evacuated because of an emergency. Things to include are family photos, family herilooms, tent, sleeping bags, extra clothing, water, food & other supplies for your pets, etc. If you need help setting up your cloud account or learning how to back up your data to a physical source, give us a call! The current information available is that this is a free upgrade offer from Microsoft It is available for a limited time. After the free offer expires, the upgrade will cost around $200. Microsoft is saying that the upgrade will be ready on July 29th. I asked Chris why our customers should (or should not) upgrade to Windows 10. Here’s what he said. It’s a free way to get the next version of the Windows operating system. My computer has Windows 7 Professional 64 bit, and I was presented with the choice to receive the new operating system as a free upgrade. This is the general direction of where Microsoft is going with the operating system, and you are probably better off with it than without it. 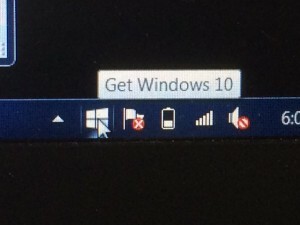 There has been discussion about the Windows 10 user interface being more like Windows 7 than Windows 8. Since Windows 10 has not yet been released to the public, what it is is still an unknown. If you have applications which require Windows 7 or XP, or there is concern because those applications have not yet been tested to work with Windows 10. If you need to reinstall the operating system onto your hard drive or SSD in the future, you’ll have to install the previous version of the Operating System, but may not be able to receive the update to Windows 10 without paying for it. The upgrade may not include an installation disk, which would allow a clean install of the Windows 10 operating system in the future. Apple has been offering OS upgrades as digital downloads through their App Store for years, and no one is complaining. The no-media upgrade process tends to work, even though it takes several hours to download (1-4H depending on the speed of your line to the Internet) and install (1-2H depending on the speed of your computer and the speed of your hard drive). However, I think this will be the first Operating System upgrade that Microsoft is doing that is a digital download. The Windows Operating System Upgrade is inherently more complex than the Apple Operating System Upgrade, because Windows runs on many more machines from different manufacturers (Dell, Lenovo, Toshiba, HP, etc., etc.,) than the Apple software does (which is exactly one: Mac’s). The Apple environment is proprietary and “closed”, eg: you are licensed to only run the Apple Operating System on Apple hardware, where the Microsoft Operating System does not have this constraint. Apple doesn’t charge for new versions of their Operating System, but Microsoft traditionally has. Let us know if you have any questions about Windows 10!